Wilma Mae Wallace (1889-1972) was an early graduate of Reid Hospital’s Nurses’ Training School. At that point it was a three-year course, and she and four others graduated in June 1914. She remained at Reid Hospital after her graduation. Soon after President Wilson’s declaration of war in April 1917, Wallace registered with the American Red Cross then waited to be called for service in the Army Nurse Corps. On February 20, 1918, the Richmond Palladium announced that Miss Wilma Wallace was on her way to an Atlantic port to embark for Europe. She was the first of many Richmond nurses to head overseas during the war. 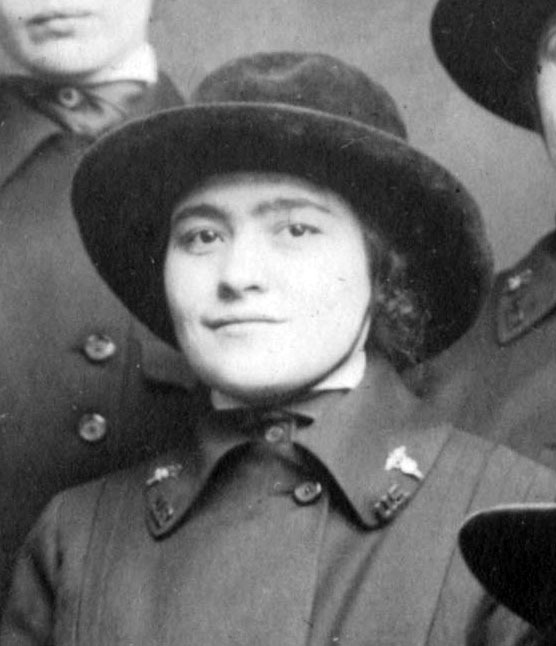 While at Ellis Island waiting for transport, she was assigned to Hospital Unit “I.” This unit left on March 22, 1918 and landed in Southampton, England on March 31. By the middle of April she arrived at US Army Hospital #204 in Hursley, England, near Winchester, and here she remained on duty until after the war. She was stationed at US Army Hospital #53 from January to April 1919, and returned to America. As a member of the Army, she and her fellow nurses qualified for the 1936 bonus that was issued to all soldiers and sailors who served in the war. Miss Wallace did not marry and continued her nursing career until her retirement. She moved to California in the early 1920s and remained there until her death in 1972. She was active in nurses’ associations and returned to Richmond for several Reid Nursing School reunions. A collection of her wartime mementos were donated to the Wayne County Historical Museum, and currently several are on display at Morrisson-Reeves Library. Her uniform and several photographs are in a tall case just inside the main entrance, as well as her original diploma from Reid Memorial Hospital Training School for Nurses.